My pieces are inspired by the depths of complexity and the fragility of the human experience. Through color, texture and negative space, I attempt to mimic the ebb and flow of our existence on the planet. The premise of each painting is to illustrate the rise from darkness, pain and confusion of life’s elements to merge to clarity, light and forgiveness. My work is an invitation to connect. There is the honest element in every piece I create. Acrylic, Oils, Pastels and Mixed Media are organically combined with fingers to mix, scrub, rub my way to a place of acceptance and beauty. Amy’s studies at Textile and Design school of NCSU, menswear, fabric colorist, suit and sport coat designer for Geoffrey Beene, Oscar De La Rente and Nautica, as well as her studies in London, San Francisco gives her diversity that is uncommon. She most well known as one of Greensboro’s prime commission artists, selling over 500 paintings. Her work is represented at Love Art in Norwalk, CT., Paul Robinson Fine Art in Atlanta, and Tyler White O’Brien Gallery in Greensboro. Currently VIVID Interiors, Irving Park Art and Lucky Fish Galleries showcase her work. She is a Prime Artist for LEE Industries showroom for Furniture Market and revered abstract artist for Interior Design firms state wide. Today her work ranges from sleek and minimal to organic, complex and multifarious. 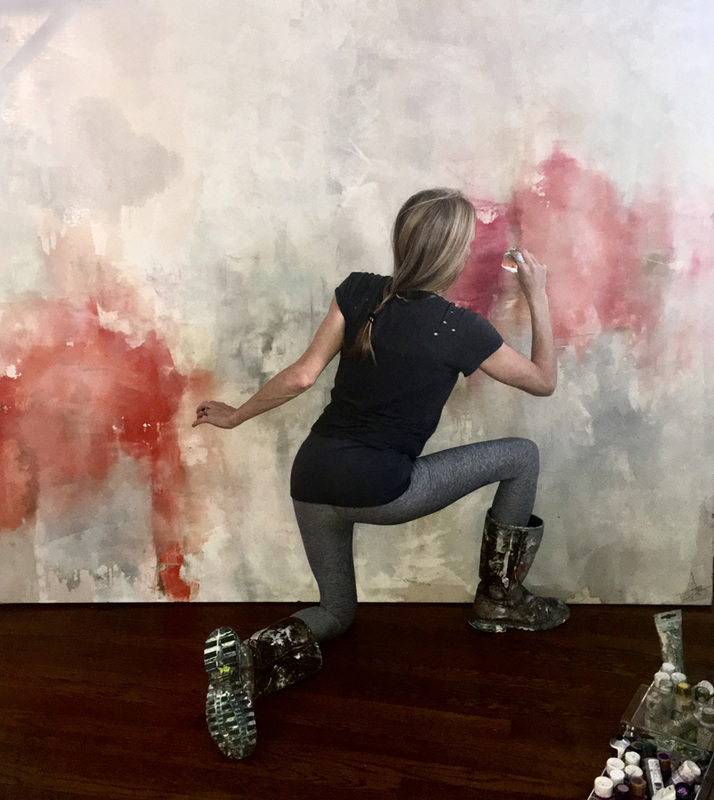 Amy brings a unique balance of subtle surprise and authenticity to her all of her paintings.